All smiles: citizen of the year, Ruth Hartcher-O’Brien after being presented with her award. As part of Liverpool’s Australia Day citizenship ceremony, the newly minted Aussies get up from their chairs which are under the giant marquee and walk across to the stage when called. And what you notice straight away is their smile. 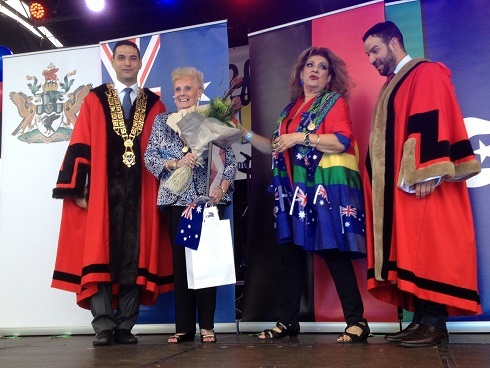 It’s the biggest smile you’re likely to see in a while, but when they are given Australian flags to take up to the stage for photographs with the mayor and other officials something impossible happens: the smiles get even bigger. And that is when it hits you: these people who have come from the four corners of the earth know better than you and me how lucky they are to be in the land Down Under. Their smiles say so much more than a thousand trite words in speeches about the best country in the world; the lucky country; the great and wonderful country. Which Australia surely is, but it takes the big smile of someone from Ghana or Greece to hammer home the point much better than any politician’s speech. 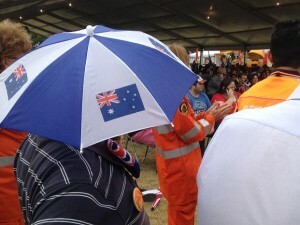 Here’s the Aussie flag: new Aussie citizens going to the stage for official photos with the mayor and other VIPs. It gives you goosebumps is what a moment like that does for those of us who have been here so long we sometimes take our good fortune for granted. 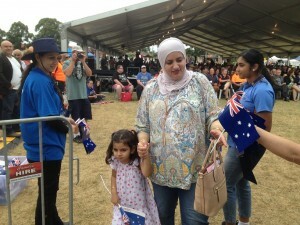 At Liverpool’s Woodward Park earlier this afternoon, 57 people became Australian citizens, joining thousands of others across this wide, brown land, in hundreds of towns and cities. But few would resonate as much as Liverpool, which Australia Day ambassador Maria Venuti said was the most multicultural place in NSW. Try Australia, as anyone who lives and works here will tell you. Some of our 57 new fellow citizens came from places that would not surprise, such as Afghanistan, Cambodia, Nepal, Turkey and Ghana. Not to mention Fiji and Egypt and India, Kuwait, Vietnam, Pakistan and Jordan. But try good, old US of A and Canada as well. That’s when the penny really drops: the whole world wants to live in Australia and a fair few are very happy to stake their future within the melting pot of Liverpool. 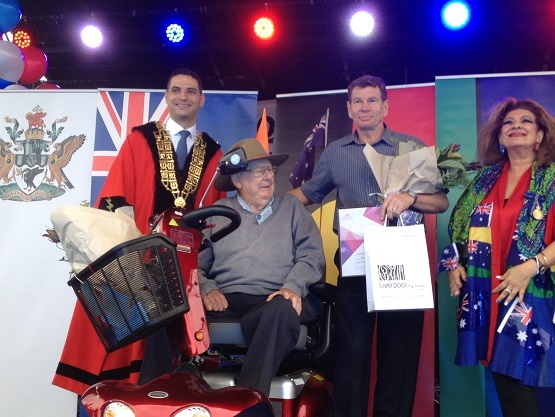 Some of the town’s special residents are honoured this time of the year for the good deeds they do and which make Liverpool another great Australian town. Macquarie Award – Miller Technology High School. 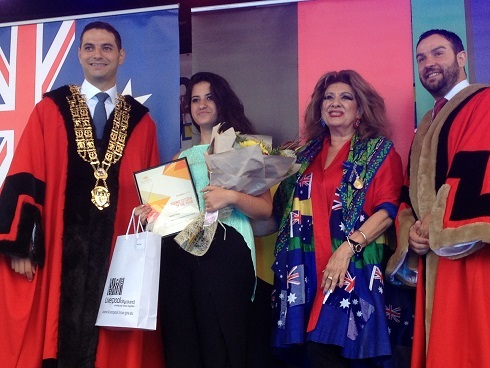 Mayor Mannoun, left, deputy mayor Peter Ristevksi and Maria Venuti present the Young Citizen award. 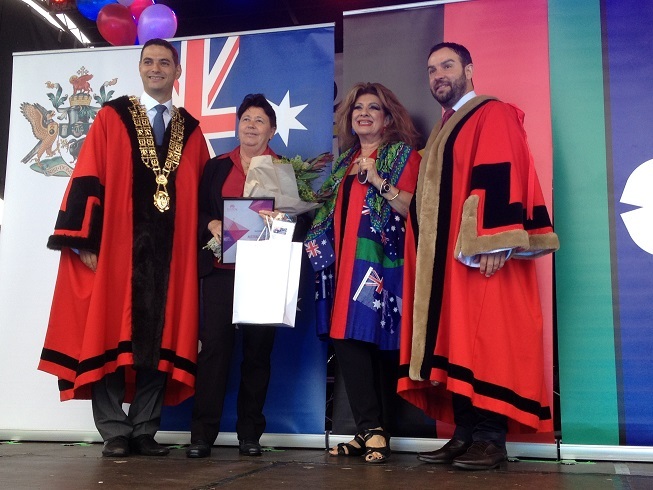 “As part of the Australia Day celebrations each year, the National Australia Day Council publicly recognises outstanding contributions made by local residents. The recipients of the awards were all nominated by family, friends or their peers for their work in the community. 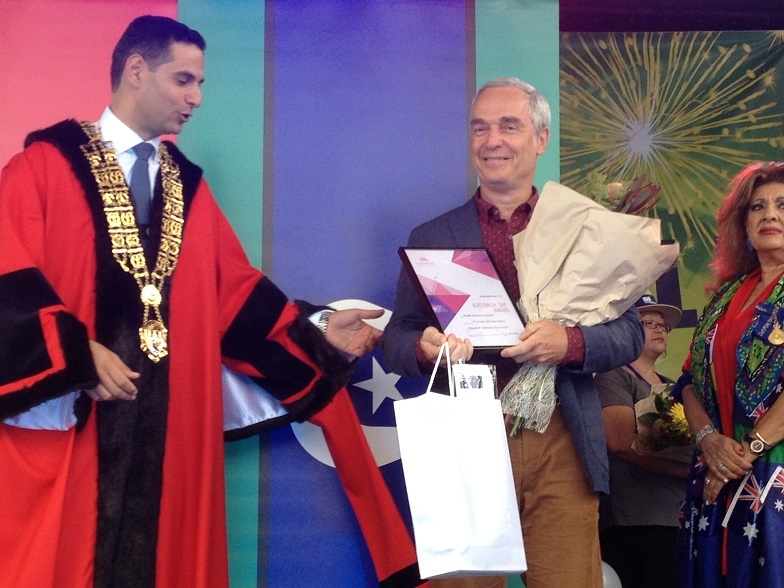 “These awards give the City of Liverpool the opportunity to say thank you to its citizens, and publicly acknowledge their valuable contribution within our community. 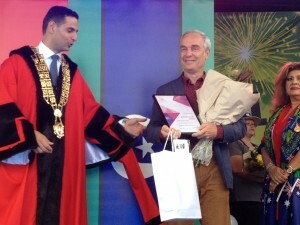 To receive one of the awards is an outstanding achievement that is well deserved by the recipients,” Mr Mannoun said. Citizen of the year Ruth Hartcher-O’Brien was nominated for her sustained contribution to supporting young refugees and migrants from the Liverpool area. She gives to the Liverpool community with her enthusiasm and passion. She has made a significant and valued contribution to the lives of many young people from refugee and migrant backgrounds in the Liverpool area for over two decades. Through her guidance and support, she has been instrumental in mentoring and fostering outstanding young citizens. She generously gives her time during the school holidays to mentor students on leadership camps, training future leaders and developing mentor s for the ‘Tree of Life’ Program. She has supported the Liverpool Refugee Week Committee, annually since 2004. Senior citizen of the year Judy Pack accepts her award. 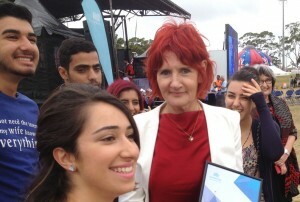 Young Citizen of the Year Sarah Yahya has been in the Liverpool Youth Council since 2012. She has been involved in many of council’s projects such as the City Revitalisation project. 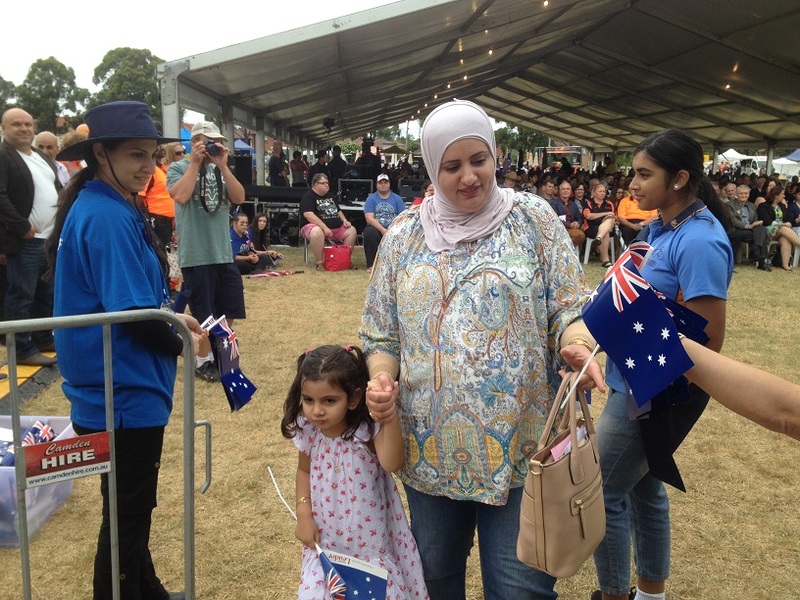 She volunteers at many events including The Mayoral Concert, International Day of People with Disability, Liverpool Chalk Board Project, Australia Day, Youth Week and many more. Sarah is a driven and passionate young person. She has a refugee background and although she has a hearing impairment this has not stopped her. She has been awarded a High Order of Australia for Community Service, a Defence Force of Australia Leadership Award and Rotary Youth Leadership Award. She has been chosen as an Australian representative at the 2015 Harvard National Model United Nations, and was sponsored by the University of Technology Sydney where she is completing a combined journalism and international studies degree. Peter Fraser comes on stage in his wheelchair to help present the award named in his honour. Senior Citizen of the Year Judy Pack has been the driving force behind the Liverpool and District Historical Society for many years. She has been instrumental in finding and developing premises for the society. She has overseen the development of the important resources, items and records held by the society. Winner of the Fraser Environment Award Michael Streatfeil has devoted time, energy and passion to the Liverpool environment. He is passionate about the environment and sustaining Liverpool and volunteers a lot of his time. He is also a passionate photographer and shares his photos of native animals with others so they can be used for educational purposes. 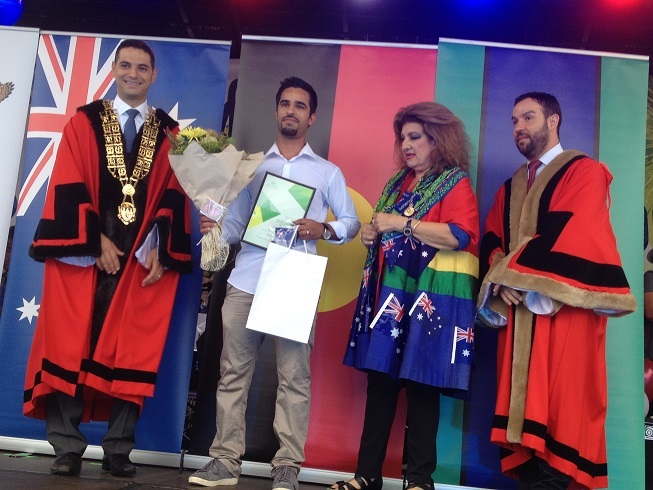 As part of the day, Mayor Mannoun and his deputy, Councillor Peter Ristevski, also presented winners of the Order of Liverpool with their awards. The awards winners are named the previous year but it has been decided the presentation will be held on Australia Day from this year. Kevin Perry – Companion of Order of Liverpool (CLO), Sean Matthew William Langshaw – Companion of Order of Liverpool (CLO), Josef Stanioch – Officer of Order of Liverpool (OLO), Gina Sinozich – Member of Order of Liverpool (MLO), Guiseppe Callipari – Member of Order of Liverpool (MLO), and Dawn Madden – Member of Order of Liverpool (MLO). 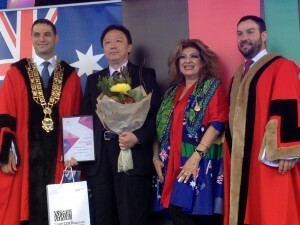 Presentation of the small business award. Son Mohamed accepts his father’s sports award.